Hundreds of supporters turned out at Monument Circle in downtown Indianapolis this afternoon for a rally dubbed "Indy Culture Matters." Organized by the Indianapolis Consortium of Arts Administrators (ICAA) consisting of Central Indiana's largest arts and cultural organizations, the event was staged in response to possible government funding cuts and to raise awareness of the importance and impact of cultural destinations to the Indianapolis economy and to the city's reputation. 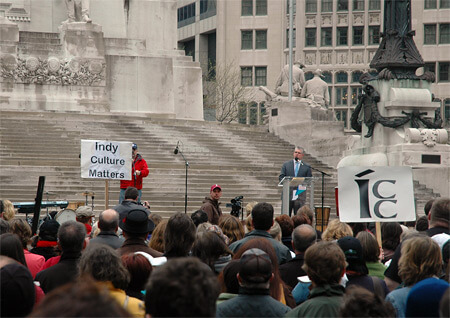 "The purpose of the Indy Culture Matters Rally is to share with our fellow Hoosiers in a very tangible way, the impact of arts and culture on our everyday lives on a personal, emotional and economic level," said Glen Kwok, president of the ICAA and executive director of the International Violin Competition of Indianapolis. "Most importantly, we want the community to understand that in addition to playing a role as a vital industry in central Indiana's economy, these cultural destinations and arts organizations reach people from all income levels, age groups and cultures whether through direct or indirect participation." According to the ICAA, the arts generate $468 million in economic activity each year in the city of Indianapolis. ICAA organizations annually welcome more than 4.1 million visitors to museum exhibitions, musical performances, live theater and other cultural experiences. and Visitors Association, addresses the crowd.